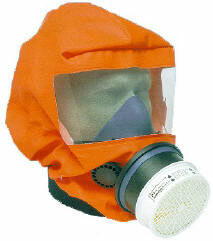 The SR77 is a filter respirator combined with a protective hood with a visor. It is used for self rescue from fire and smoke. The device can be put on quickly and simply in a single action, without any adjustment. Safety Equipment America, 11 Business Park Drive, Branford, CT 06405. Tel: 203-483-9483; Fax: 203-483-6633.